Each country has its own version again of this one. Some stuff the buttery layers of Fillo dough with pistachios, others with walnuts, others with cream or even plain. 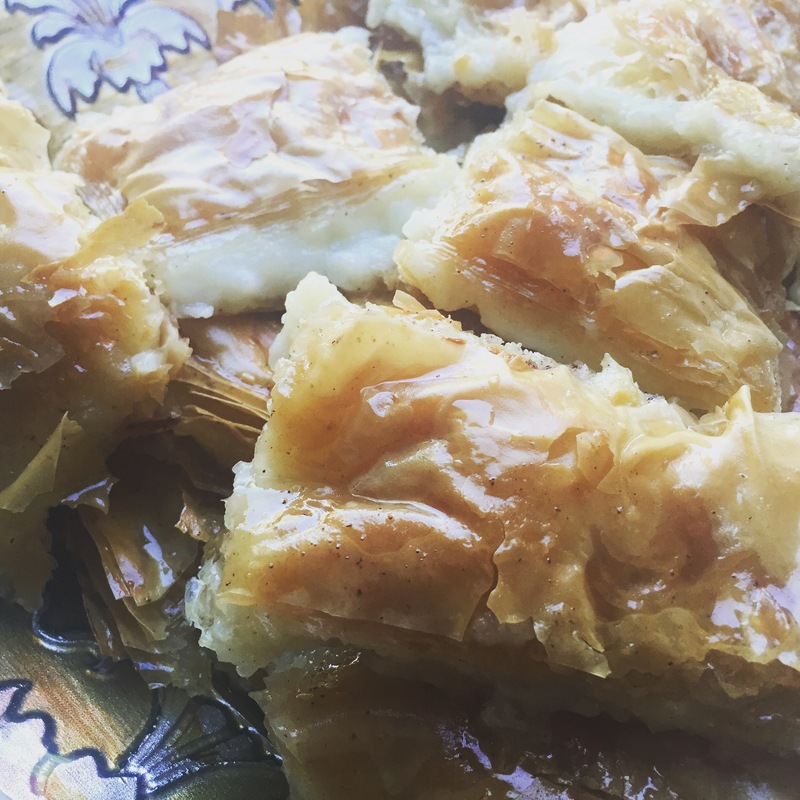 Baklava could be covered with honey, sugar syrup or sugar syrup with some rose water flavors. They also come in different shapes as in triangles, quadrilaterals or rolls. 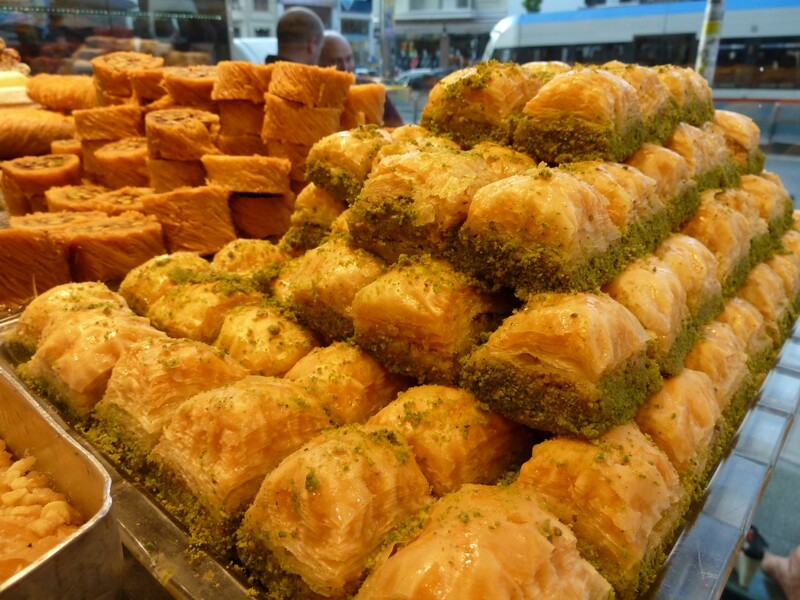 Egyptians rarely make the baklava at home, since it is pretty affordable, tasty and everywhere in the sweet shops ready to be delivered . 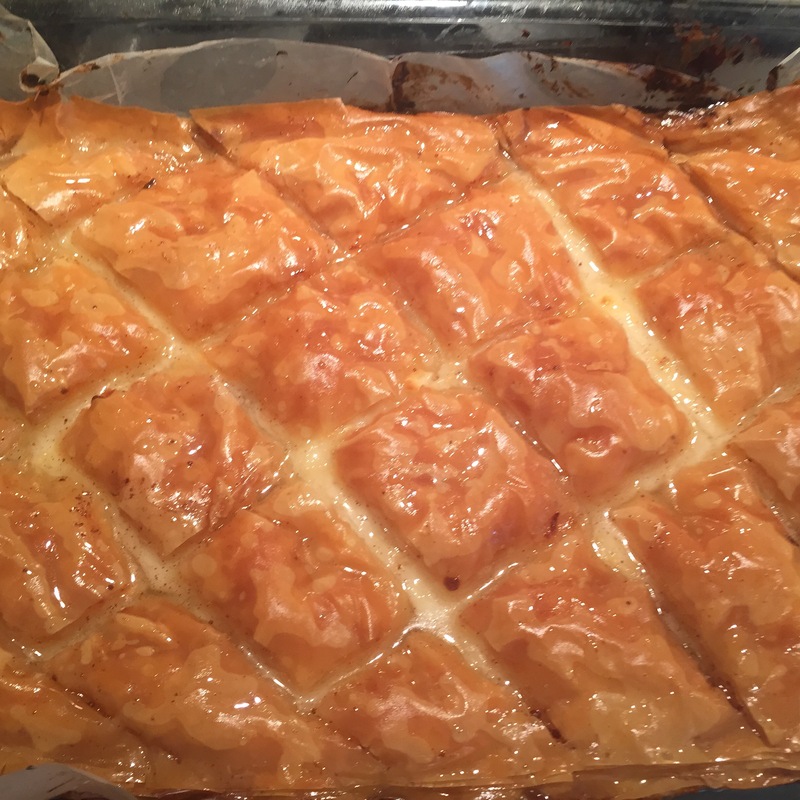 Today I am making the homemade version of the baklava stuffed with cream. For easiness, I am making the simple shapes as shown below. 1/4 cup of heavy whipping cream. Let’s start with the cream filling first. 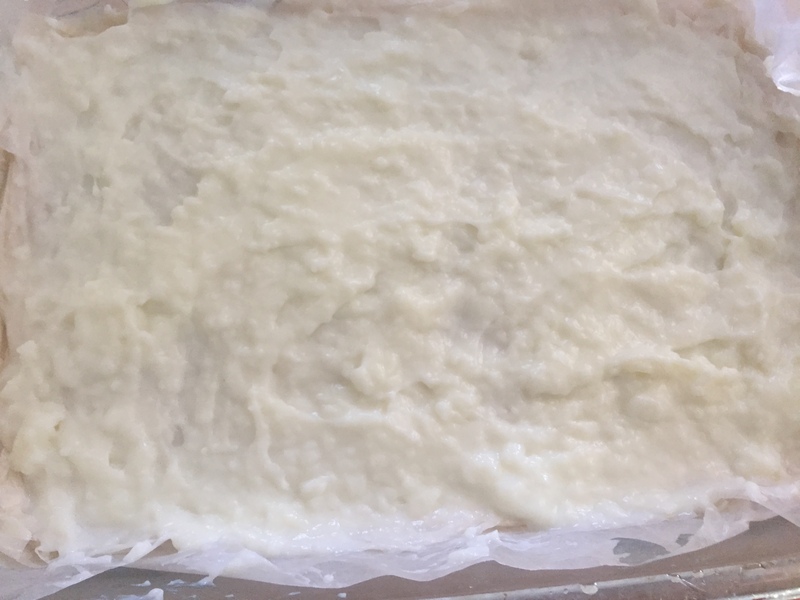 Mix the 4 tbsp of corn starch in the 1/4 cup of heavy whip cream. 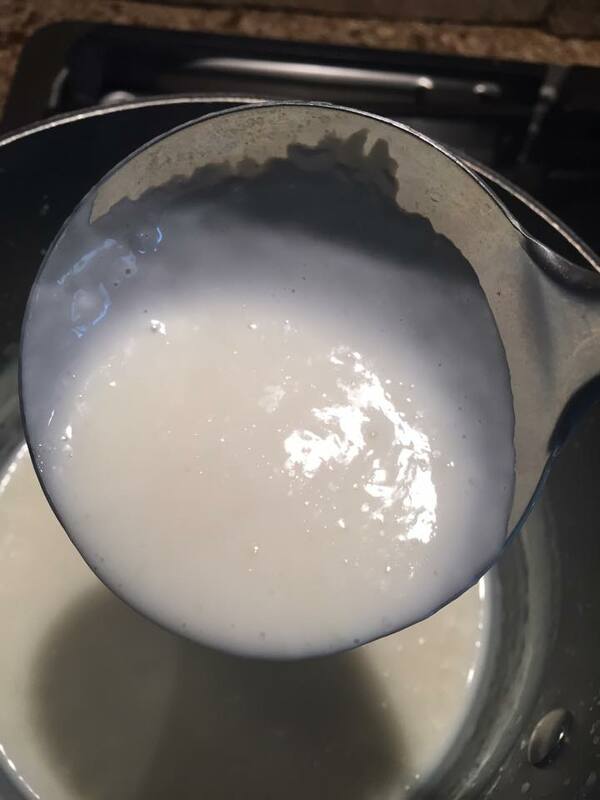 In a medium pot on medium heat, bring the milk, corn starch mix, vanilla and sugar to boil. When it starts to boil and thickens, simmer down for few minutes. Take off heat and set aside in a bowl in the fridge to cool down. 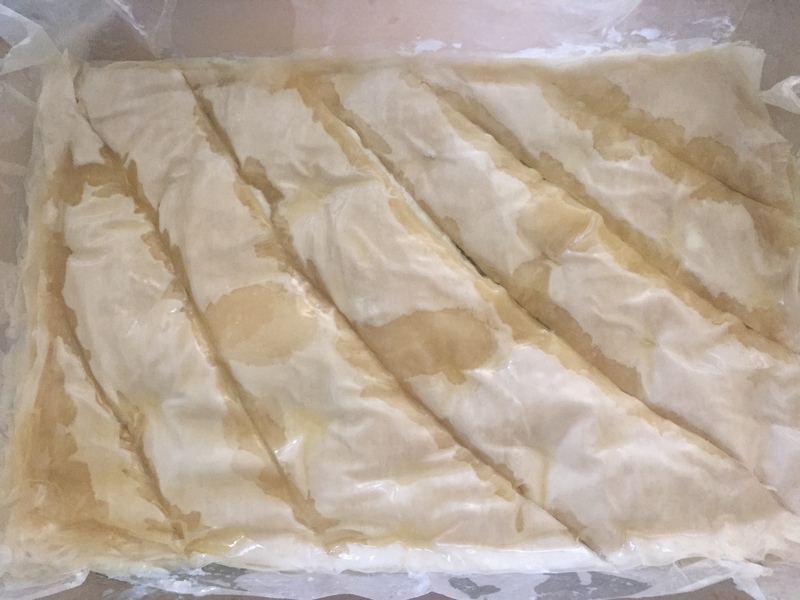 Then, we will work on the sugar syrup since it needs to be in room temperature when poured on the hot baked baklava. Add the water, sugar and vanilla in a pot on medium heat. Simmer down for another 10 minutes. 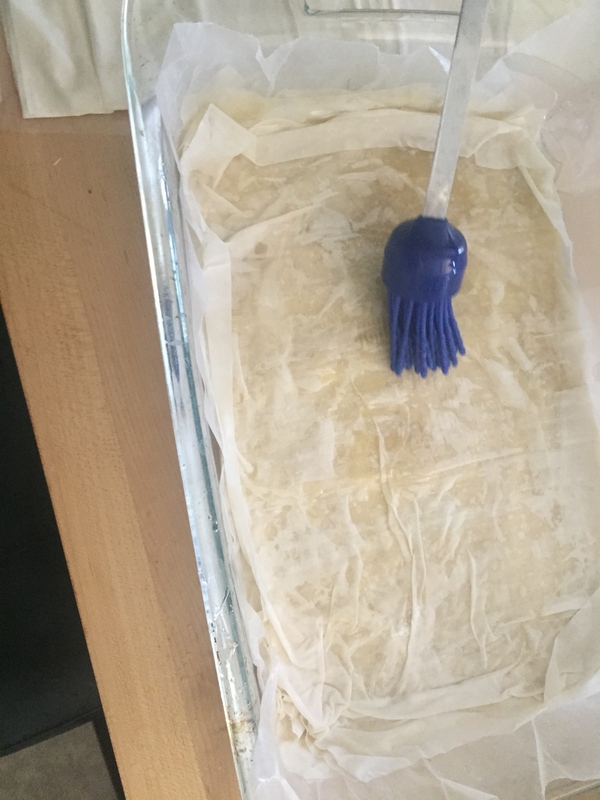 Note: Fillo dough sheets could get hard and breakable if exposed to air for long time, so make sure to cover the sheets in the packet wrap while working with other sheets. 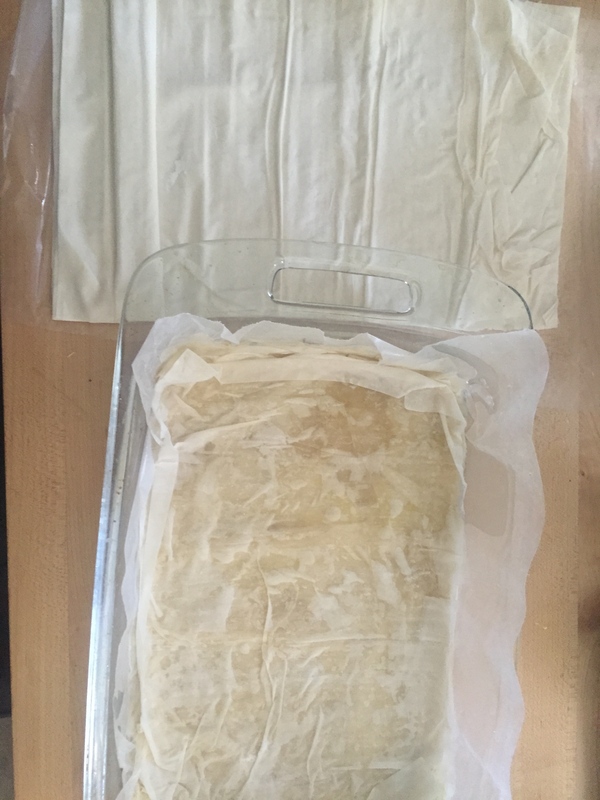 Basically, we will work with half of the sheets, add the stuffing then add the other half. Each sheet should be very well brushed with the melted butter as demonstrated below. 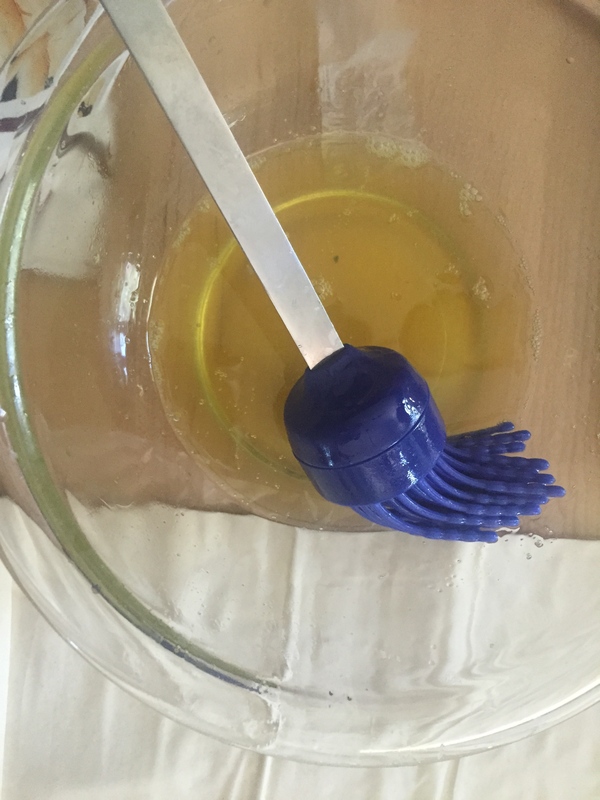 In a pyrex or any other baking dish, brush its bottom with melted butter. Add one layer of fillo dough and brush it with the melted butter. Keep doing so and brush with melted butter each single sheet until you reach half the packet. Add the cooled down cream and spread over the fillo dough layer. Add one layer of fillo dough sheet on the top of the cream and brush with melted butter. 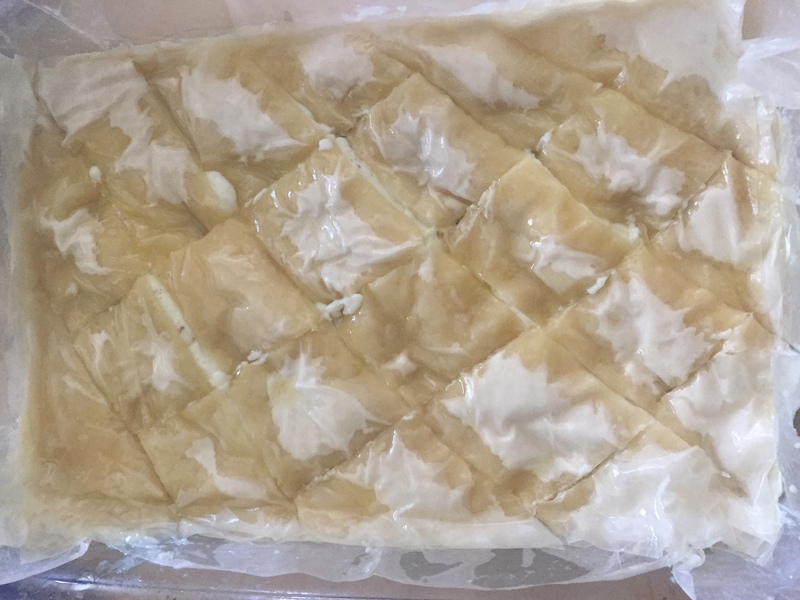 Keep doing so again and brush each sheet with the melted butter until you finish the full packet. Carefully, with a sharp knife, cut diagonal lines as below. Then cut across the diagonals another set of straight cuts. In 370 degrees F. oven, bake until golden brown. It takes around 30 minutes. As soon as it gets out, pour the room temperature sugar syrup on the top of it. Do not separate or cut in the serving plate until it is fully cooled down. 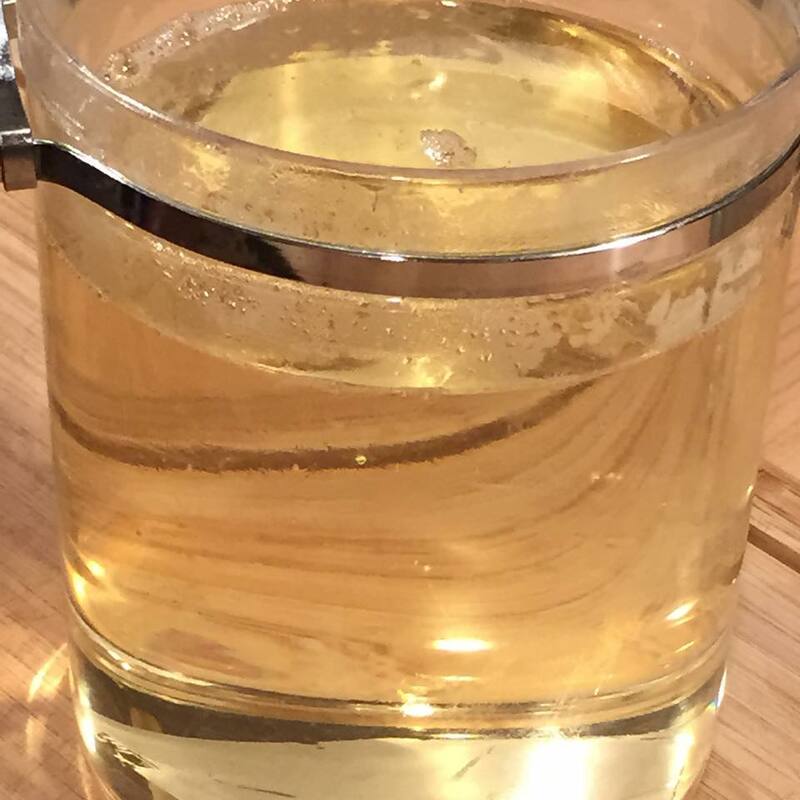 Enjoy with a cup of tea with mint. 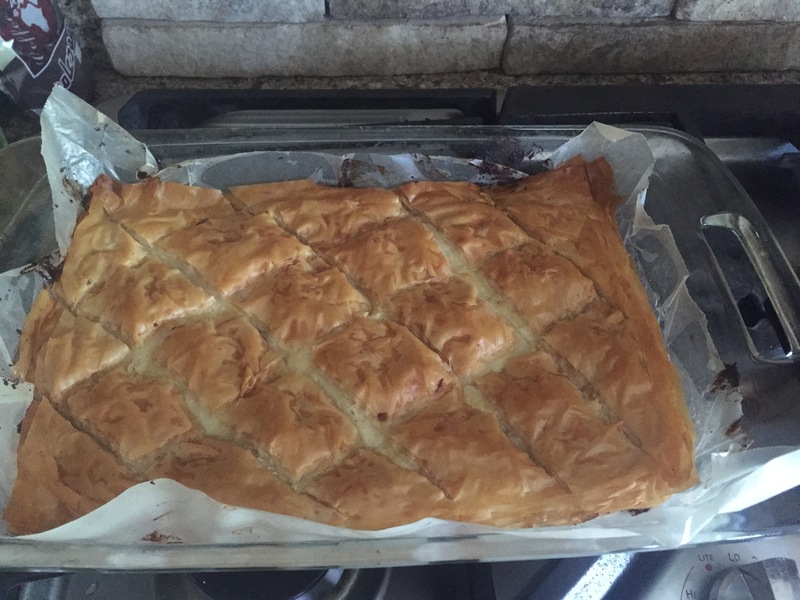 I’ve made baklava so many times and not once did it come out as beautiful as yours! Cutting the lines before baking is a wonderful tip.